One of the greatest breakfast treats in the entire Bay Area are the doughnuts at Boon Fly Cafe. Located adjacent to theCarneros Inn on Hwy 12 between Napa and Sonoma, it is something you have to know about because you’d never guess it from the outside. When you drive in it seems like you are in some kind of industrial park, but that is the fence that provides privacy for the Carneros Inn. As with nearly all the restaurants in the Valley, the prices are a bit on the high side, but when you consider the quality of the ingredients and that everything is made by hand, we’re happy to pay. Boon Fly is known for their doughnuts – you can buy them individually, but why so that when you can get a dozen in a little bucket? They are tiny, only about 1-1/2 inches diameter, freshly made to order, and tossed in cinnamon sugar. Just about as perfect as a doughnut can get, they were the perfect beginning to our day in Wine Country. Our next stop was Tin Barn Vineyards. Located in Sonoma, this time we really did drive into an industrial park. But don’t let the locale fool you, this is some seriously good wine. Hosted by the wonderful Amy and Meaghan, we were given a tour of the barrel room and tasted that day’s selection. Their Sauvignon Blanc was so good we needed two bottles to go home with us, LOL. They source their grapes from various areas so their wines are surprising at every turn. Just when I thought I knew what to expect in a Syrah, I wound up shaking my head in amazement. And by the time we got to the Cabs (my personal favorite) I was in love. Off the beaten track, small and intimate, this is exactly the kind of winery I like to bring visiting friends to. Put it on your itinerary for your next trip to Napa! 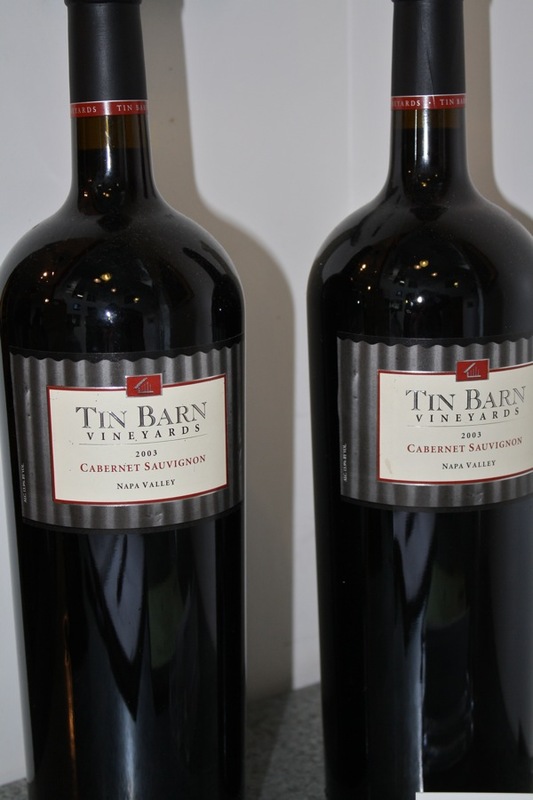 Tin Barn is in an area that has nine other wineries – they market themselves as Eighth Street Wineries – within easy walking distance from one another. Every year they all get together and host an Open House that is full of fun and always memorable. They offer both current and new release wines plus barrel tastings and food pairings. This year’s event is onFeb 26th, 11 am to 4 pm. For just $30 you can taste all the different wines being showcased, sample the delicious foods, and have a souvenir wine glass to take home. You should go and experience this wonderful gathering of artisan wineries! Back in the car and off to Oxbow Public Market in downtown Napa (the city) to see some friends. It is a large hall with soaring ceilings filled with vendors selling everything imaginable when you think of Wine Country. Like and upscale food court, you wander from place to place, each one more exciting than the last. Wood-fired pizzas, Italian pastries, Venezuelan cuisine, unique tacos, chili-rubbed rotisserie meats, fresh seafood and meats, teas, coffees, and spices from around the globe all tickle your imagination while candies, pastries, cupcakes, and ice cream beg you to leave room for some dessert. One of our favorites, Graham’s Take-away run by Graham Zanow and his wife, is the perfect place to pick up breakfast, lunch, picnic, and dinner items. 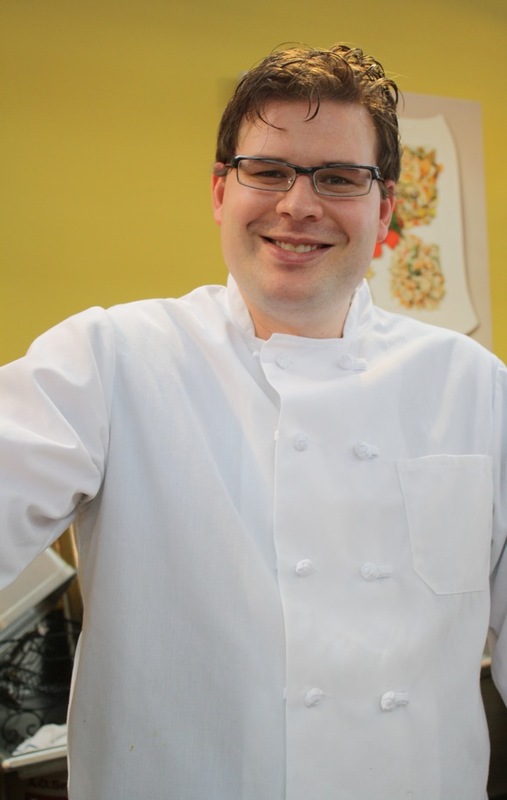 Both graduates of the CIA, Graham creates wonderful deli-style foods from around the globe using the freshest ingredients possible in new and creative ways. He loves to give out tastes of all his foods (which change daily) so make sure you check everything out. Saturday was meatloaf day – and a masterful meatloaf it was! Perfectly seasoned it was so much better than anything I grew up with. On any given day you might find quiche, zucchini bread, wrap sandwiches, curried chicken salad, and don’t miss his Mediterranean couscous – a pint always goes home with us! You are sure to find something you didn’t realize you couldn’t live without! We had more stops in our day, but now it is time to get to your favorite way to start the week… Chocolate Monday! So, what does all this have to do with chocolate? This is all about things that bring smiles to our faces and help to make a day perfect! Today’s chocolate caramel tartlets are sure to do just that. Perfect for parties, they are just the right size for finger foods. Make on their own or as part of a dessert buffet. Little cookies, mini lemon meringue tarts, etc. would be great with these. Not difficult to make but a bit time consuming, I think once you’ve made these you will return to this recipe time after time. I do recommend that if it is a warm day, you keep these in a cool area. The ganache has a tendency to get quite soft when warm and they can get messy. But what the heck, I’m happy to get my hands covered with caramel and chocolate any day of the week! To make the tart dough: In the bowl of an electric mixer fitted with the paddle attachment, cream the butter and confectioners’ sugar about 1 minute. Add the cocoa and beat until incorporated. Add the egg yolk and vanilla and beat until smooth. Sift in the flour and beat on low speed until just combined. Scrape the dough onto a sheet of plastic wrap and form it into a disk. Wrap and chill until firm, about 1 hour, or up to 3 days. Preheat oven to 325°F. On a lightly floured surface, roll the tart dough to 3/16-inch thick. Using a 2-1/2 inch round cutter, cut out 24 rounds of dough and press them into mini-muffin tins or 2 dozen 2-inch tart pans, trimming away any excess dough; prick the dough all over with a fork. Chill the tart shells for 20 minutes. Line the tart shells with foil or parchment and fill (to the top) with dried beans, rice, or pie weights. Bake for 15 minutes. Remove foil and weights and bake for 5 to 10 minutes longer or until the pastry looks dry, set, and is lightly browned. Transfer to a wire rack to cool. Remove cooled shells from tart pans and transfer to a serving plate. To prepare the filling: Place the water in a large saucepan. Add the sugar and corn syrup. Cook the mixture over medium-high heat, swirling the pan occasionally, until you have a dark amber caramel, about 10 minutes. Carefully whisk in the butter, cream, and crème fraiche stirring until smooth. The caramel will hiss and bubble up so stand back. The caramel can be made up to 5 days ahead and refrigerated. Divide the caramel among the tart shells while still warm or reheat the caramel in the microwave or over low heat until it is pourable. 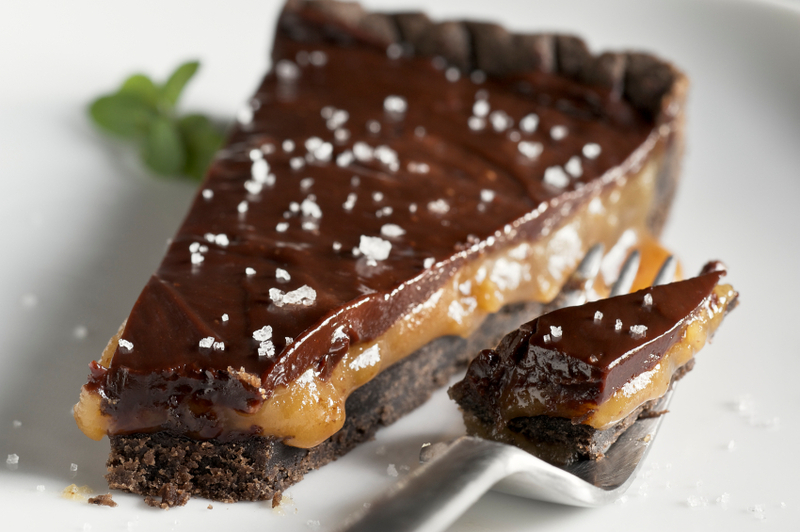 Let tarts rest until the caramel is set, at least 20 minutes. To make the ganache: In a saucepan, bring the cream to a boil. Place the chocolate in a bowl. 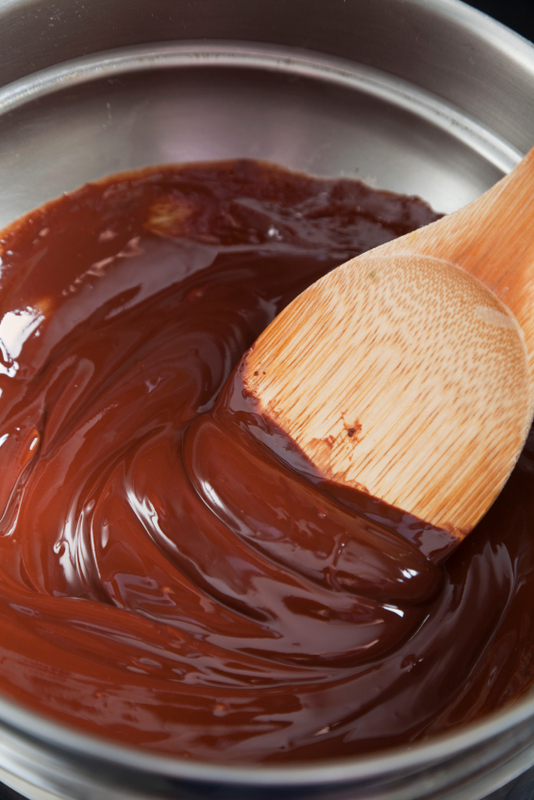 Pour the hot cream over the chocolate; add a pinch of sea salt, and let sit for 2 minutes, then whisk until smooth. Pour some of the ganache into each of the tarts while it is still warm. Let the chocolate set at room temperature for at least 2 hours before serving. Chill if you are transporting these tarts any distance. Sprinkle top with additional coarse sea salt if desired. NOTE: You can also make this as a single larger tart if you like. It is equally delicious served either way. Unauthorized use, distribution, and/or duplication of proprietary material without prior approval is prohibited. I can be contacted via email at: heritagecook (at) comcast (dot) net. Feel free to quote me, just give credit where credit is due, link to the recipe, and please send people to my website,www.theheritagecook.com.